Invertigo. Steel Vengeance. Batman. While these may sound like comic book titles at first glance, they are actually the names of popular roller coasters located at amusement parks across the U.S. that have garnered the passion and interest of Matt Schmotzer. 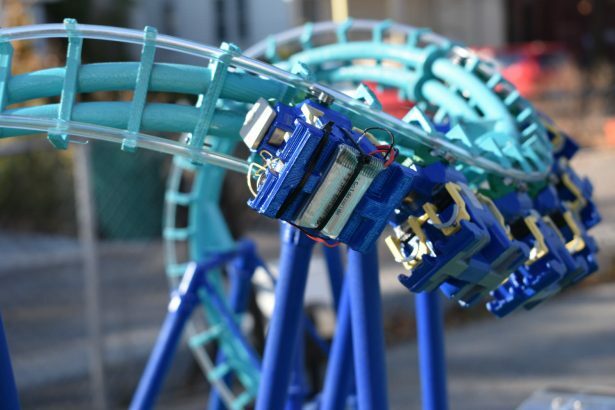 A systems engineer working on new fuel-metering systems for 2.0L/2.3L engines at the Ford Motor Company by day, Schmotzer devotes his spare time to a roller coaster replica sideline that combines his zeal for thrill rides with his SOLIDWORKS modeling skills and 3D printing expertise. 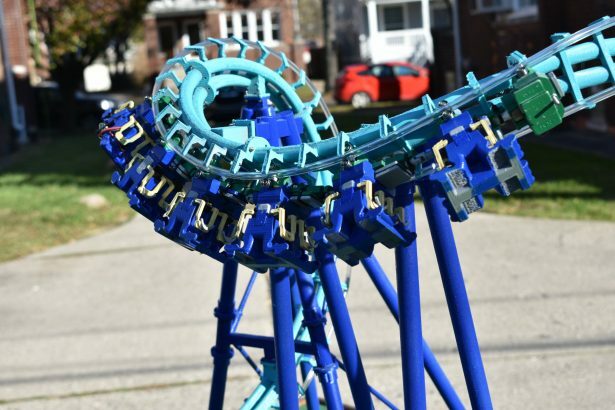 Invertigo, Schmotzer’s fully functional 1:25 scale replica of the inverted boomerang shuttle roller coaster of the same name at King’s Island near Cincinnati, Ohio, will be on display at the SOLIDWORKS World 2019 February 10-13 in Dallas, Texas. The replica roller coaster aficionado’s passion for thrill rides began after he rode the Iron Dragon, a mild suspended rollercoaster at Cedar Point in Sandusky, Ohio, as a very young child. Schmotzer’s family visited Cedar Point, which bills itself as The Roller Coaster Capital of the World with 18 roller coaster rides, every summer, and while those experiences contributed to Schmotzer’s love of roller coasters, he didn’t catch the roller-coaster-replica-making bug until he learned to use SOLIDWORKS design software while completing his senior design project at Purdue University and 3D printing tools during his work at Ford. Invertigo was Schmotzer’s first roller coaster choice because he wanted to create a replica of a roller coaster that he’d actually ridden and also needed a relatively short layout in order to fit the scaled replica in his garage. Schmotzer took the layout for Invertigo from the NoLimits Coaster Simulator 2 video game and exported the layout’s XYZ coordinate data points of the track spine into a Microsoft® Excel® spreadsheet, with which he applied the desired scaling factor before importing the scaled coordinates into SOLIDWORKS. He then used SOLIDWORKS to design the track profile, support structure, trains, mechanisms, and launch station. Schmotzer solved the friction problem by using special ceramic bearings, replaced the chain-driven lift mechanism with a magnet-based system, and replaced the 3D-printed rails with plastic tubing that he glued to the 3D-printed track, sections of which are bolted together with M2 fasteners. The Invertigo replica comprises 33 separate sections of track and sits on a 4×8-foot table. 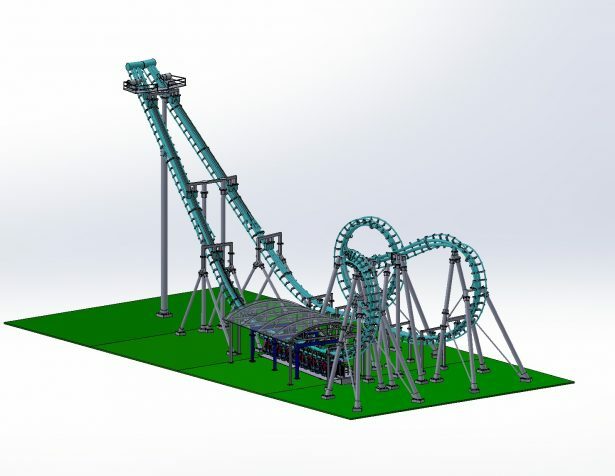 The functional roller coaster replica will be running and on display at SOLIDWORKS World 2019 in Dallas. Watch the video below to hear Matt describe what inspired him to start creating rollercoaster replicas. News of Schmotzer’s accomplishment with the Invertigo replica soon drew the attention of roller coaster fans, including the management at Cedar Point, who engaged Schmotzer to create a replica of its newest roller coaster: Steel Vengeance. 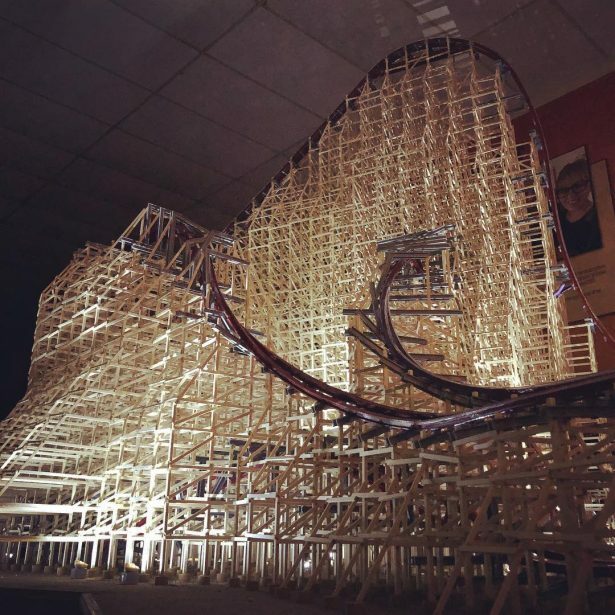 Debuting in 2018, Steel Vengeance transformed the old, wooden Mean Streak coaster into a hyper-hybrid, steel-on-wood coaster that combines the old ride layout and wooden support structure with modern steel-coaster performance, including a 90-degree, 205-foot initial drop; four inversions; and 30 seconds of airtime, the most on any roller coaster on Earth. Schmotzer was able to reduce modeling and 3D-printing time on the Batman the Ride replica by tapping his experience from the first two replica projects to develop a more systematic approach; by using additional, faster 3D printers; and by leveraging the open SOLIDWORKS API to automate the creation of track sections in SOLIDWORKS. “With Invertigo, each of the 33 track sections took 12 hours to print, so the entire track took over a month to create,” Schmotzer points out. Schmotzer also wants to use his roller coaster replica hobby to inspire the roller coaster and theme park designers and engineers of tomorrow. That’s why he brought and demonstrated his Invertigo replica during a visit with students in the Theme Park Engineering & Design (TPED) course at Purdue, where Schmotzer is working on his graduate degree in Mechanical Engineering. To learn more about Schmotzer’s roller coaster replicas, visit his Instagram, YouTube, Facebook, and Linkedin pages. I am a freelance writer who has written professionally about CAD/CAM/CAE since the early 1990s. I’ve written hundreds of case studies, numerous magazine features, and lots of white papers over the past 25 years, including many focused on SOLIDWORKS. In my spare time, I enjoy fishing, gardening, hiking, cross-country skiing, reading, and writing (fiction). Please feel free to contact me with ideas for case studies or blog posts, or just to say hello.